STAY AT HOME MOM: Personalize your T-Shirt! I'm so happy that it is getting to be t shirt weather again. I love t-shirts. They are so comfortable to wear and it's great when you can find one that you really like. I especially love t-shirts with designs on them. I also love them with sayings on them, or even both! Sometimes it is hard to find a t-shirt to your liking. Well now there is a way to personalize your own t-shirts. On Vista Print you can customize your own. They have high quality t-shirts made out of 100% preshrunk cotton. You can even choose long sleeve or short sleeve. There is also different color choices, and size choices. The sizes they have available at Vista Print are: Small, Medium, Large, XL and XXL. The t-shirts are easy to design. You can choose from a large variety of design templates, or you can even upload your own completed design and they will print it for you. Customized t-shirts are great for companies, businesses and schools. They are great for marketing your organization. Personalized t-shirts are also make great gifts to give others. And they are fun just to order for yourself too! I would love to personalize my own t-shirt. I searched Vista Prints design templates. I found a wide variety of designs to choose from. 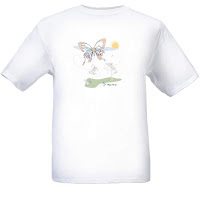 I love butterflies so I found the design below that has a butterfly on it. You can add your own text, in different fonts, colors etc. Which will make your t-shirt your own personalized creation. And the price is great at Vista Print too. You can get your own customized t-shirt starting at as little as $13.99. So if you would like to order your own personalized t-shirt, for yourself, a gift, your business or even your school, then you should visit Vista Print for easy to customize and order t-shirts! Those sound great! I'm glad you got the award the other day! Hey that's a great idea! I am on an email list for them and they send me promotions all the time, they have great deals!